I will abscond from writing this week and quote verbatim from my business partner’s blog which you can find on the MBMG website. Paul says: My colleague Steve Hinch is Australian-American - that probably goes some way to explaining his interest in both surfing and in technical analysis of capital markets. I’ve never mastered surfing and I’ve tended to be extremely sceptical about the most extreme output of ‘chartists’ but I’ve taken the liberty of forwarding Steve’s latest research outpourings that features both of his favoured activities. Growth-> Leverage-> Leverage-fuelled growth-> The burst of the leverage bubble. The best fundamental understandings of economic cycles recognize this. So do the best technical constructs. In the right hands, these come together in a harmony of understanding and insight. Enough said, let’s look at what Steve had to say. Most surfers understand that to get the best ride, you have to meet the wave at base as it is at this point you can get the most lift. When it comes to waves, one of the most fascinating areas of interest in economics has been that introduced by Russian Nikolai Kondratiev whose analysis points to a 60 year economic wave cycle going through. Nikolai Kondratiev was shot by firing squad on the orders of Stalin in 1938. He died for what he believed was the truth. His execution was ordered because his academic work propounded that the capitalist system would not collapse as a result of the great depression of 1929. This truth Stalin did not want to hear, thus Nikolai was exterminated and his work suppressed for over two decades. Kondratiev’s analysis described how international capitalism had gone through many such cycles and as such was a normal part of the international mercantile credit system. The long wave cycles that he identified through meticulous research are now called “Kondratieff” cycles or “K” waves. * Winter: excess capacity worked off by massive debt repudiation, commodity deflation & economic depression. Many analysts seem to accept as fact, that most winters in K cycles last 20 years. However, history shows us that there is not that total consistency. While most long cycle waves last around 60 years, the length of the recessionary winter declines phase seems to depend on the length of the autumn peak maturity of the wave. 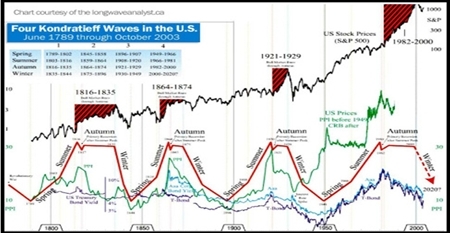 For example, in the first wave shown in the chart which ran for 55 years from 1789 until 1844, the Autumn peak phase ran for 19 years and the corresponding winter recession was short running for 9 years. The next cycle ran for just 42 years from 1854 until 1896, the autumn peak phase was a short 10 year cycle and followed by a long 22 year recessionary winter phase. The next cycle ran for 52 years, from 1897 until 1949, the autumn peak phase in this case was a short 9 years and subsequently the winter recession phase was a long drawn out 20 years. The current long wave cycle we now find the world in commenced in the heydays of 1950 and has been a long cycle running for 62 years to date. We are now in the final stage of this long cycle which is the winter deflationary cycle. As pointed out earlier, many analysts have suggested the average winter cycle is 20 years. However, as I have shown, there has not been an average, but the length of the winter cycle appears to be dependent on the length of autumn peak. History suggests that the longer the autumn peak - the shorter the winter downturn. In the current long wave cycle the recent autumn peak ran from 1982 to 2000 or a total of 19 years, making this a long phase autumn cycle, suggesting the winter cycle will be shorter, or based on history between 9 and 11 years. Thus in all probability we are now setting the base to start moving from a “winter recession” to a “spring” phase in the near future. The beginning of a new long wave! Like all cycles, K wave analysis is more “descriptive than prescriptive”, but provides enormous insight into our current economic condition. Such evidence also supports the proposition that the central bank intervention may simply be prolonging the agony through 5 trillion of credit expansion and they should liberate the “international market” and let it intelligently and efficiently do what it has done 18 times before. Central banks and governments have spent other people’s money to try to save and return to the glory days of this long wave cycle. They will not accept that the old cycle must end. The passing of the old provides the room for a new global economy through innovation, hard work and capital formation. More debt that is only seeking to save banks and businesses best left to their just rewards is not the answer. In the current K wave, debt has driven excess capacity in banking, autos, manufacturing, retail, etc. There is not sufficient demand to keep up with the debt-financed overproduction and supply of everything. Only politicians scrambling for their political survival think the debt binge can go on forever. It cannot and it will not. The debt game is coming to its final K wave ending. Fortunately, it is not all gloom and doom. The good news is that after this destructive period is over the world economy will be ready for a new spring boom which will propel it to new levels of political, social and economic development. There remains the chance that the phenomenon of emerging markets will limit the damage of the ending of this long wave. The final systemic shock phase could be short and V shaped. Dozens of new countries are embracing and integrating with international free market capitalism. Even former communist China has joined international free market capitalism. China does not represent a new civilization; it is integrating into western civilization. Just like the surfer who is ready to position himself at the base of the wave, so to should investors be ready to position themselves at the base of the new wave/cycle… how soon will this be? Well just as the surfer does, you have to be patient and watch for signs and then be ready to act.